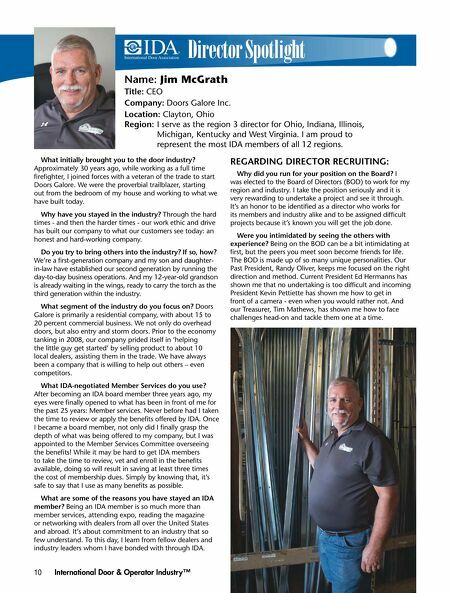 Director Spotlight Name: Jim McGrath Title: CEO Company: Doors Galore Inc. Location: Clayton, Ohio Region: I serve as the region 3 director for Ohio, Indiana, Illinois, Michigan, Kentucky and West Virginia. I am proud to represent the most IDA members of all 12 regions. 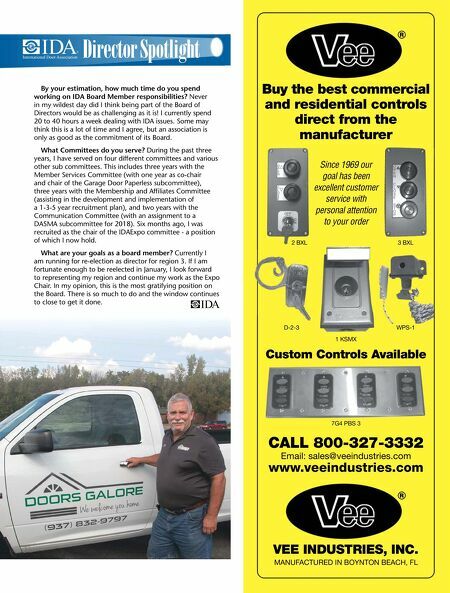 10 International Door & Operator Industry™ What initially brought you to the door industry? Approximately 30 years ago, while working as a full time firefighter, I joined forces with a veteran of the trade to start Doors Galore. We were the proverbial trailblazer, starting out from the bedroom of my house and working to what we have built today. Why have you stayed in the industry? Through the hard times - and then the harder times - our work ethic and drive has built our company to what our customers see today: an honest and hard-working company. Do you try to bring others into the industry? If so, how? We're a first-generation company and my son and daughter- in-law have established our second generation by running the day-to-day business operations. And my 12-year-old grandson is already waiting in the wings, ready to carry the torch as the third generation within the industry. What segment of the industry do you focus on? Doors Galore is primarily a residential company, with about 15 to 20 percent commercial business. We not only do overhead doors, but also entry and storm doors. Prior to the economy tanking in 2008, our company prided itself in 'helping the little guy get started' by selling product to about 10 local dealers, assisting them in the trade. We have always been a company that is willing to help out others – even competitors. What IDA-negotiated Member Services do you use? After becoming an IDA board member three years ago, my eyes were finally opened to what has been in front of me for the past 25 years: Member services. Never before had I taken the time to review or apply the benefits offered by IDA. Once I became a board member, not only did I finally grasp the depth of what was being offered to my company, but I was appointed to the Member Services Committee overseeing the benefits! While it may be hard to get IDA members to take the time to review, vet and enroll in the benefits available, doing so will result in saving at least three times the cost of membership dues. Simply by knowing that, it's safe to say that I use as many benefits as possible. What are some of the reasons you have stayed an IDA member? Being an IDA member is so much more than member services, attending expo, reading the magazine or networking with dealers from all over the United States and abroad. It's about commitment to an industry that so few understand. To this day, I learn from fellow dealers and industry leaders whom I have bonded with through IDA. REGARDING DIRECTOR RECRUITING: Why did you run for your position on the Board? I was elected to the Board of Directors (BOD) to work for my region and industry. I take the position seriously and it is very rewarding to undertake a project and see it through. It's an honor to be identified as a director who works for its members and industry alike and to be assigned difficult projects because it's known you will get the job done. Were you intimidated by seeing the others with experience? Being on the BOD can be a bit intimidating at first, but the peers you meet soon become friends for life. The BOD is made up of so many unique personalities. Our Past President, Randy Oliver, keeps me focused on the right direction and method. Current President Ed Hermanns has shown me that no undertaking is too difficult and incoming President Kevin Pettiette has shown me how to get in front of a camera - even when you would rather not. And our Treasurer, Tim Mathews, has shown me how to face challenges head-on and tackle them one at a time.